Home cleaning £11hr. Housekeeping, End of tenancy cleaning, Carpet cleaning.Call us on 02085088129.No monthly contract. three profiles were found for Cleanwell-london.co.uk in social networks. Among other social networks the website is represented in Facebook, Twitter and GooglePlus. The web server with the IP-address 213.152.250.14 used by Cleanwell-london.co.uk is run by Gunix and is located in Great Britain. 32 other websites are located on this web server. Most of them are provided in the english language. 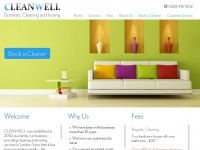 The websites of Cleanwell-london.co.uk are served by a Apache server. The HTML pages were created with the latest standard HTML 5. Both the inclusion of the website in search engines and follwoing of its hyperlinks is explicitly allowed.